TROPICAL MODERN. 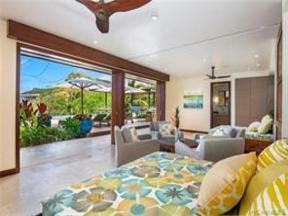 Meticulously designed home offers stunning sun and moon rises over the Mokulua Islands & ocean views from every room. At entry, a floating staircase with a water feature and pebbled wall. The upper floor boasts the master with an inside/outside bath & gorgeous kitchen with Wolf appliances, four dishwashers, and a dumbwaiter. The living room, dining room, and kitchen open completely to a breathtaking view of the sea, with 40 feet of sliding doors on one side and 20 feet of sliding doors on the other. Outdoors, the 66-foot lap pool sets the ocean view for the lower entertaining area with one of a kind floating Wolf BBQ and a classic surfboard shower. Walk out the back and a path takes you directly to MidPac. Great location-proximity to Kailua, Honolulu Airport and Hospitals.